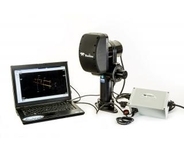 BlueView BV5000 3D Mechanical Scanning Sonar System - BlueView's BV5000 3D mechanical scanning sonar create high resolution imagery of underwater areas, structures, and objects. Get 3D laser-like scanning capabilities underwater, even in low and zero visibility conditions and seamless integration with traditional laser scan imagery. Kongsberg MS1000 - Mechanical scanning sonar for harbour defence, police search and recovery, scientific assessment and survey. Blueview P900-130D - At 900 kHz the P900 Series is the ideal sonar for underwater detection and identification operations.